As today (18 October) is World Menopause Day, it is worth thinking about an issue that affects 3.5 million women in the UK workplace who are aged 50 and over. At the Environment Agency, 44% of the staff are women, and 27% of those women were over 50, like myself, which is why I got involved in setting up the Women's Network menopause community group. It felt like a good time for me to lead that work, as the menopause was starting to become more of a ‘thing’ for me to contend with. Since then, I’ve gathered a group of people who share my passion for positive action. The group has launched a discussion pack, which has been a hugely exciting milestone to reach, which offers useful information about the kind of symptoms colleagues can suffer from - some were news even to us! I didn’t know that palpitations, sleep disturbance and fatigue, being prone to inflammation and infection, poor concentration, joint pain, and new or worsening allergies are all part of some people’s experience of the menopause. The pack also provides some very useful, practical ways in which managers and colleagues can work together to provide simple adjustments at work to help with some of the symptoms. Some of the solutions are a change to working hours, considering working from home, reducing travel by considering dialling into meetings or considering a temporary adjustment to shift patterns. The group has worked so hard to raise the profile of the menopause and I am so proud of our efforts. It’s a difficult subject to talk about, but if we don’t talk then we keep it all a hidden, taboo subject and people suffer in silence. That is such a shame when a few simple changes and a sensitive ear can make all the difference. Our work across government is also helping to provide us with a great platform to share ideas, resources and information. Working together means we can best use our energy to provide the best support we can in our different organisations. 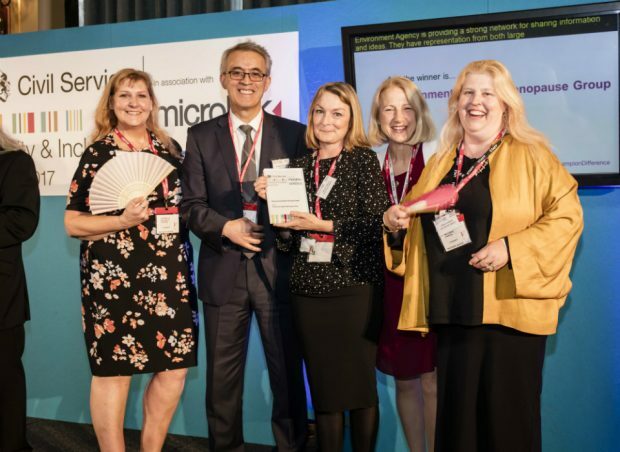 Last week the group was thrilled to be recognised in the Civil Service Diversity and Inclusion Awards in the Championing Gender Equality category. We won the award in our category, despite really tough opposition, and we are all still walking on air as a result. Friday 13th definitely was our lucky day! I previously felt as though I was nearing the twilight of my career. Now, I’m energised and enthused about my work and the future, and hope I’ve helped make it easier to talk about the menopause at work. Can I just mention the menopause isn't just reserved for the 50 and overs? I'm sure you know, there are many women who can go through the menopause at a younger age, for a variety of reasons, either naturally or medically induced. The lead up to the actual menopause can be where the fun and games start too! Maybe there needs to be a perimenopause day too. Thank you for bringing this subject to the fore, being thrown into menopause after a total hysterectomy I was surprised at the lack of information and support. Couldn't agree more Vanessa and my own experience of the menopause (and others in my family) was that it started before the age of 50. It is an important point. Thank you for making it. I think that it would be useful for LMs to familiarise themselves with this pack, however, given the sensitivities surrounding this issue, I am not sure how many women would want to have that discussion. So interesting to read this. Is the pack available for others to use? Can't see a link to it.